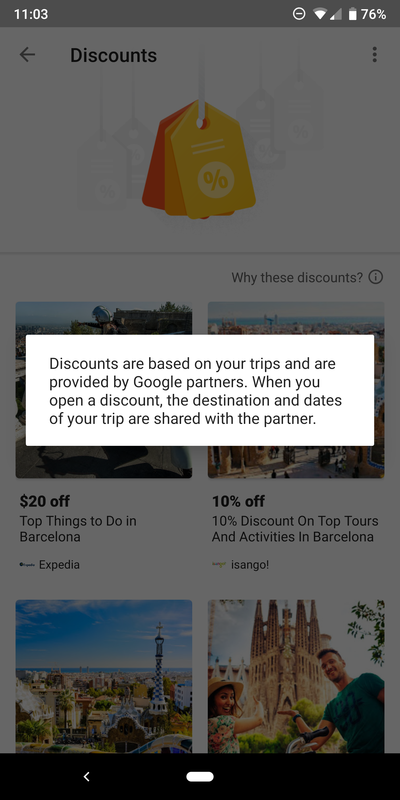 Although discounts became available toward the end of 2017 in Trips, I've rarely seen them mentioned online. Even my Android Police colleagues didn't know about them until I brought them up a few days ago. So here's how they work, in case you've never used them before. The Google Trips app is available both on Android and iOS. 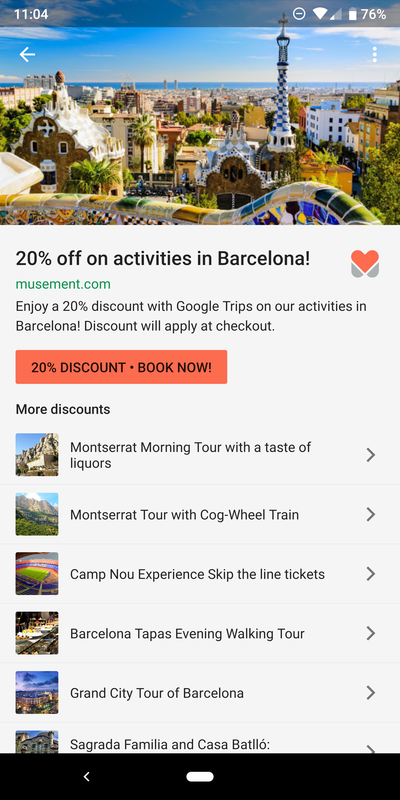 All your trips are populated automatically when you receive an email (on your Gmail account) with a flight or hotel booking. If you don't use Gmail, you can still manually create a trip, enter the destination and dates, add reservations, etc... Open any upcoming trip in the app (discounts don't show up for past trips) and scroll down to the Discounts card. 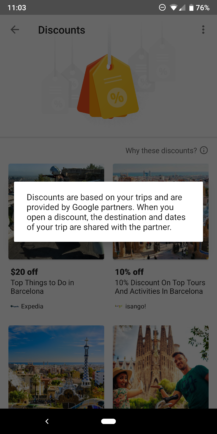 This will show a section with all the partner discounts available. A small explanation tells you that once you tap on any of these, your destination and dates will be shared with the partners. I've been using this feature for over a year and never received unwanted spam from any of the sites, so for now, it doesn't seem like Google shares your gmail address too. Tap on any partner and you'll get an idea of what they sell. 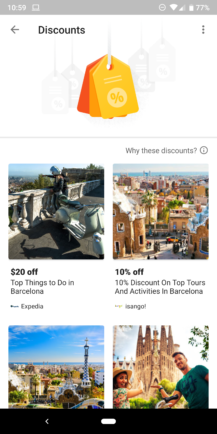 You can go directly to one of the highlighted discounts, or tap the general button with something like "20% off · Book Now." This takes you to the partner site, with the discount code applied, and lets you browse everything they offer. 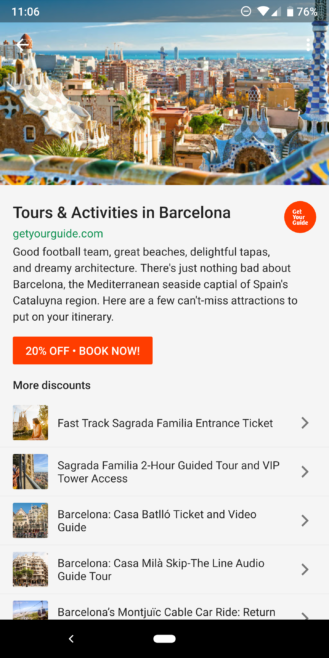 Notice the blue banner on top of the Get Your Guide page (right) when I browse from Google Trips. Among the partners, Get Your Guide is by far my favorite. 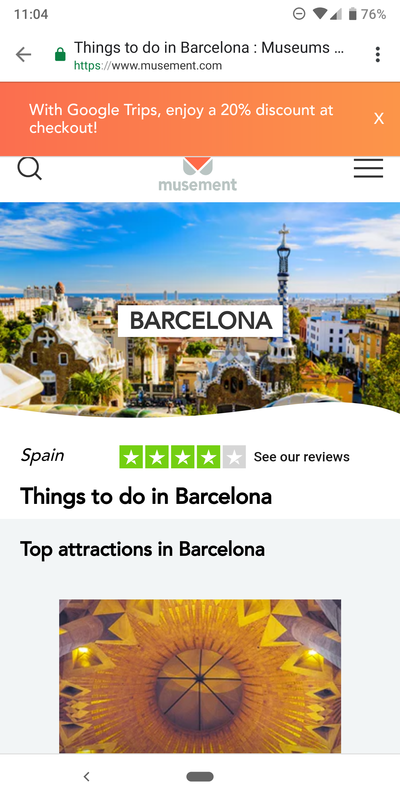 It has travel cards and public transport passes for most cities I've visited so far, entrance tickets to most attractions, and other "experiences" with guides and multi-day plans. 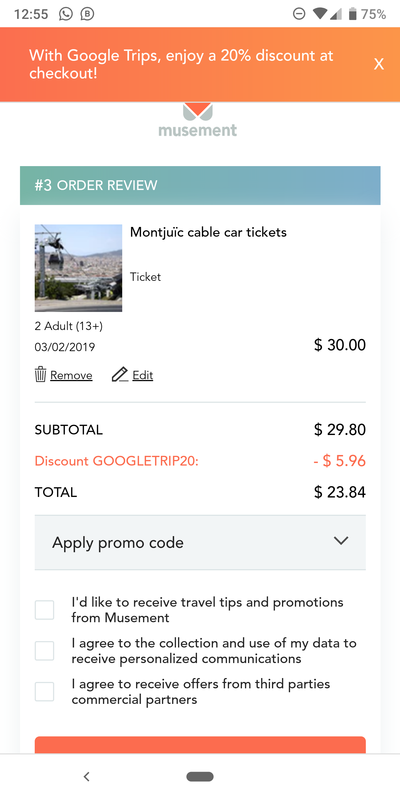 If you click through Google Trips, a 20% discount code is applied to your cart — no questions asked. Whatever you buy, regardless of date, time, quantity, country, and city you choose, you get 20% off when you check out. Seriously, this is gold. Better yet, Get Your Guide supports logging in with Google (which makes things easier). Based on my experience with the site, ticket prices on it are usually either the same as the official source, or 1-5% more. When you factor in the 20% discount, you're still saving at least 15%. The second partner I often look for is Musement. 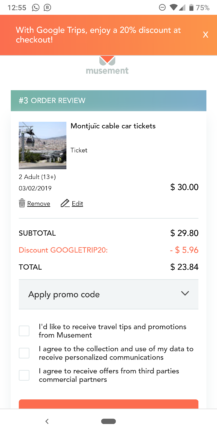 It also supports the same 20% off, no questions asked discount as Get Your Guide, and has a similar variety of things to buy at similar prices. 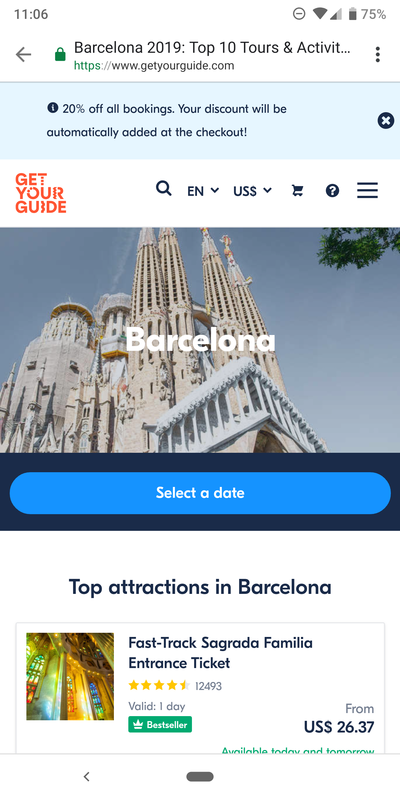 It's slightly more organized when you want to browse offers at a specific attraction or location, and it's a good back-up option when the time/date you want is fully booked on Get Your Guide. However, it only lets you register an account with a Facebook login — which is befuddling. 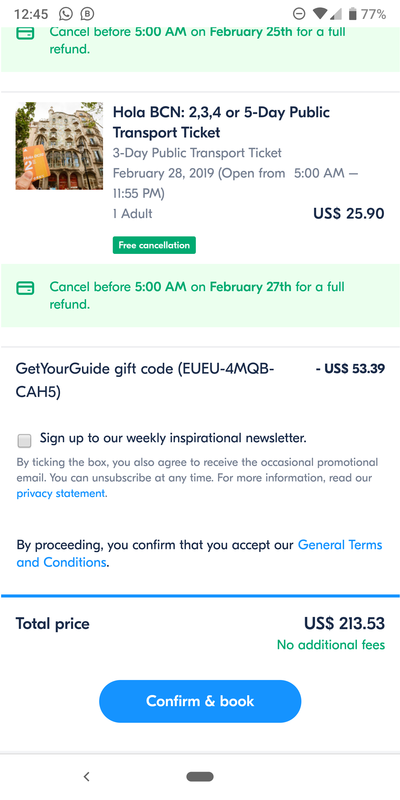 You can still make a purchase and benefit from the discount without registering first or having an account, so it's not a complete deal-breaker. Musement comes in handy when I don't find what I want / the dates I want on Get Your Guide. Having planned a trip to Vienna, 3 cities in Nepal, Abu Dhabi, and now Barcelona in less than 12 months, I've developed a couple of habits when using Google Trips. I'll share them below in case they might help you. 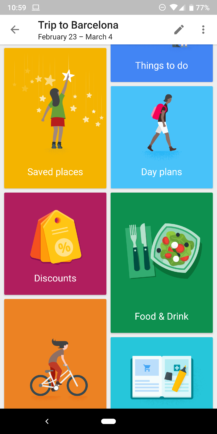 Instead of being locked to my phone, browsing things, I peruse Get Your Guide from my computer or the dedicated app on my tablet. I find the things I want to buy and add them to my wishlist. I don't like the lack of proper search, filters, and sorting methods in the service, but it's not a huge deterrent. I got used to it. 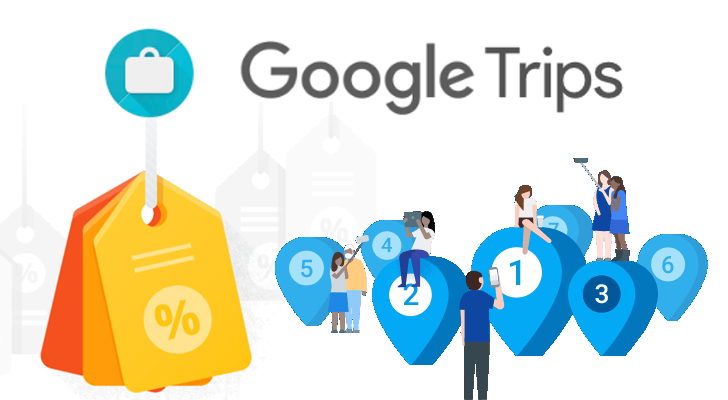 Once I know what I need to buy and the exact dates/times, I just open Google Trips, on my phone navigate to Discounts then Get Your Guide, add each wishlist item to my cart, and purchase. It's faster this way. Whenever I travel, I plan for one or two major things to do every day, but not more. The rest is free and flexible time for wandering around, checking markets and stores, soaking up the local culture, and enjoying impromptu events or things I stumble upon. However, I still do my research beforehand and bookmark the secondary things I'd love to do, time permitting. If those require entrance fees, I try to find them on Get Your Guide and add them to my wishlist. 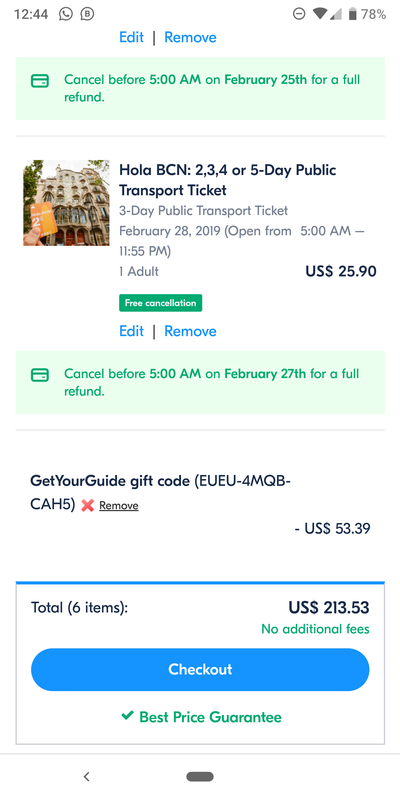 That way, even if I decide to buy the ticket on the same day, or 1-2 days before, I can still do it easily from Trips without additional research and while benefiting from the 20% discount. 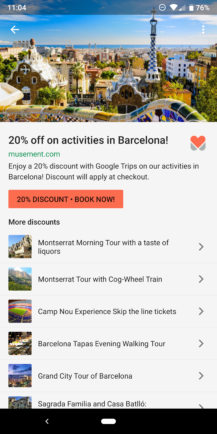 It's true that I end up buying most of my tickets and things from Get Your Guide and Musement, but I think you shouldn't forget to check Google Trips' other partners. There are taxi companies, local experiences, and other travel events and sites that you might like. Discounts are usually 10-15% on those sites, and some of them offer unique experiences that you won't find elsewhere.